Breeders using natural means to grow, care for, and produce Shetland Sheep, Angora Goats and Angora Rabbits. Located in Jackson Center, PA.
Glenrose Farms, in southern California, breeds both white and naturally colored Angora goats. Glossary of terms relating to white and colored angora goats, their production and fiber. Angora goats and gifts made from mohair. Located in Harmony, MN, USA. Breeders of Navajo Churro sheep, colored Angora goats, Finn sheep, Angora rabbits and Miniature donkeys in Claysville, Pennsylvania. Wonderful pictures of colored and white Angora goats from a farm in western Washington state. Alpaca and Angora Goat breeding farm in New Hampshire including a product store. A family farm in Michigan specializing in Shetland Sheep and naturally colored Angora Goats. Llama sales and fiber from llamas and angora goats. Located near Los Angeles in Southern California. Homestead in northern Maine, USA, specializing in registered Romney Sheep as well as Angora rabbits and Toggenburg goats. The foundation bloodlines originate from the Lockhart and Ross ranches in southwest Texas. Located in Colrain, Massachusetts. An email discussion list for the fiber goat enthusiast - Angora, Pygora, and Cashmere. Information on how to join, message archives for members only. Breeders of Shetland Sheep, Angora goats, and Livestock Guardian Dogs. Nestled along the South Umpqua river of SW Oregon. Includes shows and sales, contact information, and membership information. This farm raises Angora goats and successfully markets value added mohair products. Colrain, MA. About a wonderful adventure into the world of fiber - Angora Goats and spinning. Breeders of Angora, Cashgora, and Cashmere goats. Offering natural fibers and fiber processing as well as spinning and weaving equipment. Located in Menard, Texas, USA. Breeders of Navajo Churro sheep, Icelandic sheep, Galloway cattle, and Angora goats in Hawley, Massachusetts. 35 Camdeboo Mohair South Africa. South Africa. Quality certification body for angora goat farmers. Detailed description of standards and process. Present and future programs. Member directory. Specializing in the breeding and showing of naturally colored Angora goats and rabbits that range in color from various shades of red, copper, moorit and black. Located in southern California. Information about Angora goats and their fiber. Mohair and mohair/wool blend rovings, finished goods and animals offered. Photos of Navajo Churro sheep, Icelandic sheep, Galloway cattle, and Angora goats, information on dye studio and available products. A family owned farm located in North Central Minnesota. Raising and selling many livestock species, including Angora and Cashmere goats. Breeders of colored Angora goats with an emphasis on excellent breed qualities and well managed, healthy goats. Located in South Western Pennsylvania, USA. Breeders of registered colored angora goats offering stock and natural colored fiber for pinning, weaving, felting, and crafts. Located in Corvalis, Montana, USA. Breeding Angora Goats, bred with intent to continually improve the genetics of their herd. Also offering mohair raw and rovings, skirted for doll hair and unique felted, and knitted-with-handspun hats. Located near Asheville, NC. Site for a historic Australian farm specializing in Angora goats. Accommodations and farm tours available. Located in Horsham, Victoria, Australia. Breeders of reg. white and colored show quality angora goats. Breeding for healthy animals with sturdy bodies, soft, fine, high luster handspinning fleeces. Located in south central Pennsylvania. Goat rescue and information source for Pygmy, Angora, Pygora, and Lamancha breeds. Includes goats for sale and a list of upcoming shows. Breeders of naturally colored angora goats on a small homestead in Umpqua National Forest tell about their life and their mohair, hand spun yarn, and hand woven mohair products. We have a small farm. We raise Purebred Nubians Dairy Goats, Great Pyrenees as Guardians, Shetland Sheep, California Red Sheep, Colored and White South African Angora Goats. Italy. Manufacturers of woollen spun yarns for hand and machine knitting, and loom weaving applications, from cashmere, merino and angora wool, camel hair and silk. Technical information and specifications. List of world wide agents. English and Italian. A fiber farm specializing in Angora goats and also raising Icelandic Sheep, Yaks, llamas, and Navajo-Churro Sheep. Hawley, MA. Breeders of naturally colored angora goats on a small homestead in Umpqua National Forest. Offering mohair, hand spun yarn, and hand woven mohair products. Located in Tiller, Oregon, USA. At Willow-Haven Farms there are nearly 40 registered angora goats, miniature donkeys and llamas. Theyve been raising goats for about six years now and really enjoy it. Smithville, Ontario, Canada. Grower controlled, non-profit mohair fiber classing and brokerage company. Description of fiber classing process. Information about angora breeding and management. Links to related sites. Breeders of Cashmere, Cashgora, and Angora goats offering cashmere, mohair, and Rambouillet wool for spinners. Fiber processing. Louet Equipment and Locker Hooking Supplies. Locker Hooked Horse blankets and rugs. Located in Menard, Texas, USA. Angora Rabbits create handspun angora yarn, knitted goods, christmas gifts. Supplier of handplucked or shorn angora fiber. White and colored. Also finished garments available. Handcombed angora and blends handspun yarns, as well as books on knitting with angora. Also some finished goods. Handspun for creating knit wear, in lengths of about 60 yards each. Hand-knitted personalized Christmas stockings and decorations. Angora goat hair in a variety of colors to choose from. Offers wool and angora blend handmade hats, mittens, and scarves. Also homespun yarns and a gallery. Offers fleeces and roving from covered sheep, angora, and cashmere goats. Also information and resources. Breeder of English Lop and Angora rabbits. Show and breeding stock available. Located in Southern VT.
Offering hand-spun yarn and knitted accessories and gifts made from brushed dog hair and angora. Luxury knitwear in cashmere, lambswool, angora, merino and mohair. Includes sweaters, pullovers or cardigans. Produces and offers custom roving, batts, and webs. Includes angora, mohair, and exotic fibers. Knitting and spinning supplies and equipment. Also angora rabbits and supplies. Mohair and angora ready to spin or felt. Small family farm in Massachusetts. Will turn wool, camelid, mohair, angora or other fiber into batts or roving. Offers affordable mohair, alpaca and angora yarns imported from Russia and sold in North America. Producer of handspinning fibres of angora, wool and blends, as well as protein fiber dyes. Includes show schedule. Nevada high desert ranch raising wool, angora, and mohair, and breeding stock. Fiber descriptions, photos, order form. Offers mohair, angora, and wool. Also wheels, books, and dyes. Breeding stock available, farm tours, educational exhibits, and demonstrations. Features knitting machines including restored sock machines Also handmade Christmas Stockings, yarns, boiled wool and natural fiber related items. Giant and English Angora rabbits. Angora wool, making wool clothes and promoting the care and health of Angora rabbits. Located in CA. Information on and link to a Yahoo! discussion group for angora ferret enthusiasts. Forum for Angora rabbit breeders and owners. Live chat rooms and message boards where you can post your questions, answers and suggestions. Complete and concise description of the Turkish Angora. A list of Angora rabbit breeders sites belonging the NARBA club. Information, links, and breeder contact information for the Turkish Angora cat breed. Specializing in German Hybrids for highest wool volume for spinners. Pedigreed and show quality English Angora and Black Himalayan Rabbits. Owners and occasionally breeders of pedigreed, show quality, English Angora. Photos of the herd. The Officially Unofficial Loose Association of Angora Rabbit People. Information on how to join this email based club. Also raises Turkish Angora. News, guestbook, history and standards, pictures. Located in HÃƒÆ’Ã‚Â¤rryda, near Gothenburg. A mailing list suitable for people of all ages who own or fancy the English Angora. Information on how to join the group. Message archives for members only. Breeders of American Fuzzy Lops. Info on the Development of Otter Colored Fuzzies. Also raise Eng. Angora, Polish and Lionheads. Breeder and exhibitor of English Angora Rabbits. Information on varieties, exhibition, and care, including feeding, grooming and woolblock. Port Angeles, WA. A CFA breed club. Photographs, breed winners, breeder listings, articles and chat. French and Giant Angora rabbit rabbitry. Breeder strives for temperament, quality and wool production. Breeder of Belgian Hare Rabbits, English Angora and English Lops located in North Carolina. ARBA registered rabbitry. French, German and English Angora Rabbits bred from Grand Champion lines, pedigreed bunnies for show, wool and pets. Earth friendly rabbitry located in CA. Purebred, pedigreed Mini Lop, English Angora and Dwarf Hotot rabbits available. This email list helps facilitate communication among the membership, regarding the club and Angora Rabbit husbandry. Information on how to join, message archives for members only. Breeders of show grade English, French, German, Giant and Satin Angora rabbits. Also offer Mini-Rex, New Zealands, Californian and Commercial meat rabbits. Wooley Boogers Rabbitry is the home of Grand Champion English Angora Rabbits and Flemish Giants. oil and acrylic paintings of local scenes in the midwest, hand-crafted hats made from wool and angora. SiteBook Angora City Portrait of Angora in Nebraska. 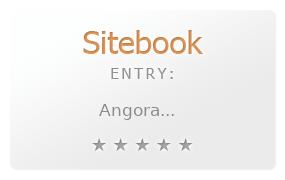 This Topic site Angora got a rating of 4 SiteBook.org Points according to the views of this profile site.